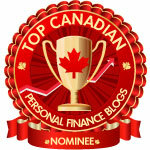 Canadian Financial DIY: My Retirement - Should I buy an Annuity? Why am I even considering this step? First, I'm in my early 60s and no longer earning appreciable employment income. Yup, I'm retired and I would rather not un-retire if I can avoid it. Second, I'm getting CPP but OAS is a few years off. I do not have any defined benefit pension so my investments in various registered plans, a TFSA and a non-registered account are the only possible sources of living expenses for the rest of my life, though at some point I am likely to receive a lump sum inheritance. Probably I am fairly typical of a growing number of Canadians, for whom the comfort of DB pensions providing assured lifetime income is no longer a possibility. Guiding principle #1 - Match spending liabilities with income assets. To the extent possible I want my various spending needs for food, housing, recreation, health to align with income sources in terms of timing, amounts, regularity and certainty aka riskiness. Grocery money, electricity and property taxes are essentials and must be matched by equally reliable income. On the other hand, I can put off or reduce travel. This means matching the characteristics of income-producing assets with retirement financial risks and desired benefits, many of which are unique or especially important to the withdrawal phase of investing and to later life. The following chart summarizes the nature of the two main categories of financial products - i) stock & bond portfolios in the various types of investment accounts like RRSPs, RRIFs, LIFs, LIRAs, LRIFs and Defined Contribution pension savings plans and ii) annuities, CPP & OAS and Defined Benefit pensions. The striking feature of the chart is how well the two categories complement each other. Neither ticks a Yes in every box but where one category falls short with a No, the other in almost every case has a Yes. The two exceptions are inflation protection and tax minimization, where each category can only offer partial protection. The obvious conclusion is that every retiree needs to have some of both types of products, except perhaps for those lucky or wise few whose 70% of final salary fully CPI-indexed DB pensions are more than adequate and who are net savers in retirement. Guiding principle #2 - Take only as much risk as necessary. 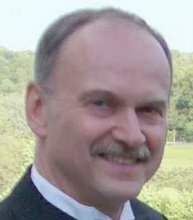 Given that my objective is to maintain the lifestyle I have been happy with through the pre-retirement part of my life, if I can see that risk-free income sources will suffice to fund that lifestyle, why should I take any more risk? 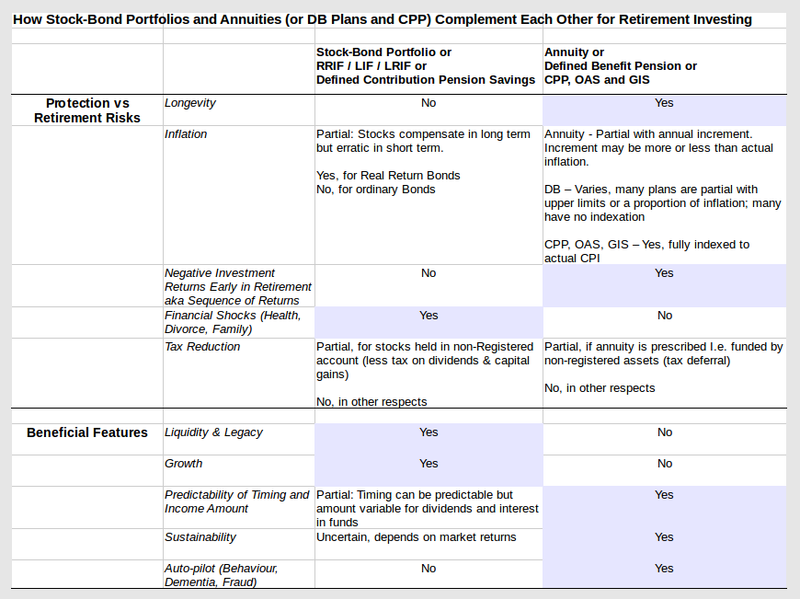 Since my present CPP and even including my eventual OAS fall far short of my essential needs, the above considerations naturally lead me to plan for an annuity. Good article and well thought out! Best of luck as you work through this.